This is the final Architectural Engineering thesis report for my mechanical redesign of the Center for Sustainable Landscapes submitted on Wednesday, April 4, 2012. Sections discuss: building overview, existing mechanical system overview, proposed redesign, mechanical depths, construction management breadth, electrical breadth, energy and cost analysis, and conclusions / recommendations. Comprised of 111 total pages, the full report is linked from the image below, and executive summary is copied below. New energy efficiency policies, a global social responsibility to “live greener”, information technology advancements, and energy efficiency pressures from other industries have all raised the standard to which mechanical systems in buildings are expected to perform. The owner of Phipps Conservatory expected the highest performing, sustainable building that technology has to offer with a new facility currently under construction. 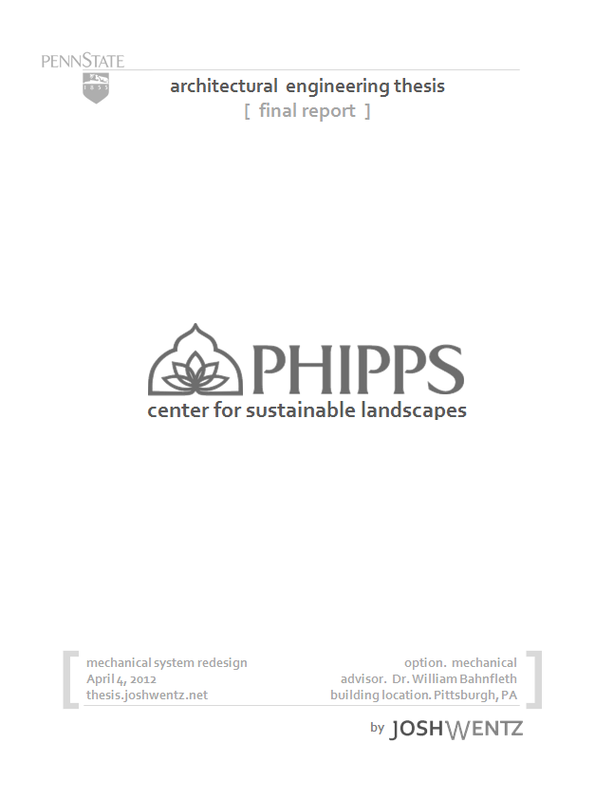 Phipps Center for Sustainable Landscapes (CSL) is a new 24,350 square foot building in Pittsburgh, Pennsylvania. The building will be comprised of classrooms, offices, and conference rooms for Phipps employees and university researchers. The estimated date of construction completion is April 2012. Phipps strives for CSL to exceed the United States Green Building Council’s highest certification, LEED (Leadership in Energy and Environmental Design) Platinum. Currently, the mechanical system of CSL has a full geothermal ground source closed loop system, a 12,400 cfm rooftop energy recovery unit, a demand control ventilation system, an underfloor air distribution to supply air directly to the space, and a direct digital control building management system. It was simulated to consume 19,926 BTU/SF annually for electricity, 75% less than a building of its size, function, and location. The main goal of the redesign was to decrease initial costs while maintaining similar energy performance. The first mechanical depth was to replace the $114,329 priced green roof with a spray cooled roof. The spray cooled roof works by misting water onto the roof during the summer months. Cooling is provided to the envelope through the evaporation process. This alternative proved to cost 94% less in up-front costs and to save more energy through cooling months than a green roof. Yet, through heating months (October to March) the green roof performed better due to adding an additional layer of insulation. The second mechanical depth was to redesign the $100,000 full geothermal system with a hybrid geothermal system. Since CSL is cooling dominated, a cooling tower was added to provide heat rejection during peak conditions. Through this depth and a construction management breadth of optimizing the most economical number of boreholes it was determined that a 10 ton cooling tower with a reduced borehole depth could cost $46,458 less to install while only nominally increasing annual utility costs by $352. The final electrical breadth attempted to capitalize on the 946 solar panels on site. Through a direct current distribution system as opposed to an alternating current, DC-AC and AC-DC inefficiencies could be removed. Results show that by having a DC microgrid within CSL’s building, photovoltaics could produce an additional 53,966 kWh having a value of $4,390 annually. Overall, the redesign met the goal of decreasing initial costs by a total of $183,286 and only slightly increasing the energy performance by 2,561 kWh.